Surprisingly, for the Create 92 series I have stayed with creating faces. Do you recognize this lady? 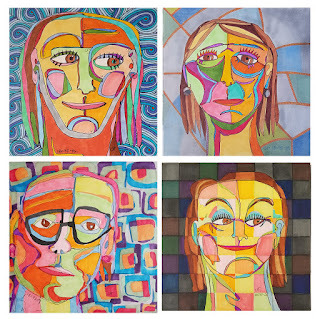 Some of the sixty two pieces I've created to date are self portraits like these four. These four are a few of my favorites from the series and these are all ink drawings. While researching for my teaching certificate I came across an article with the headline: If the artwork has no meaning is it just decoration? Not that decoration is bad. I like decoration. But I want to make meaningful art. A lot of the art I make is made because I want to make something happy and colorful and pretty. The purpose is to make the viewer happy. I'm not a portrait artist. I'll never paint your portrait that you will be amazed that it looks just like the photograph. I'm just not that talented. 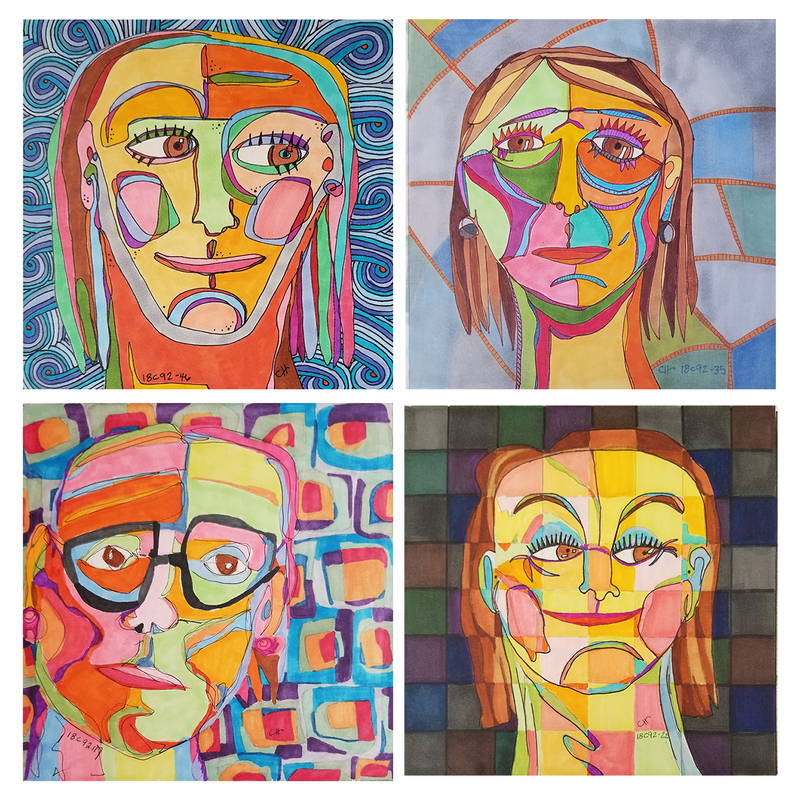 But these small eight by eight abstract portraits of me and other faces mean something to me. There's a mosaic brokenness quality in the faces maybe because I'm broken but that is offset by the use of bright colors to signify the hope and gratitude that I have in life. Our broken pieces have a tendency to create something lovely inside of us. My resting face is not attractive. I've been cursed with almost non-existent and down-turned lips. And almost every time I take a picture, one eyebrow decides to have a life of its own and shoots up. Our quirky, wonderful faces. We all have a face. They're all different but at the same time all the same. Our faces tell others how we're feeling. Happy, angry, sad or just your regular, neutral sometimes resting ugly face that makes others wonder what we're thinking. Wonderful, wonderful faces. In making these pieces, I like the control I have in making the ink drawings and I like the freedom and looseness I have in making the acrylic paintings. They're both wonderful in their own way. As of this moment, August 2nd at 9:32am, I have 30 more to make and everyday I'm excited to see who shows up.